I spent four hours at the March For Our Lives on Saturday and asked dozens of protesters what specific legislation they wanted to see passed to end gun violence. They, to a person, wanted to see “assault weapons” banned and forcibly bought back from legal owners. After filming, I wandered the march observing the signs and messages people were sending. Some of the signs were profane. Some more bizarre. Others seemed ill-informed. However, the most peculiar and frankly hypocritical thing I saw at the march did not happen on stage or even in the audience. The most hypocritical thing happening at the March For Our Lives took place backstage. Each celebrity speaker and high school activist who took the stage to give an impassioned speech condemning firearms was themselves protected by a wide arsenal of firearms. 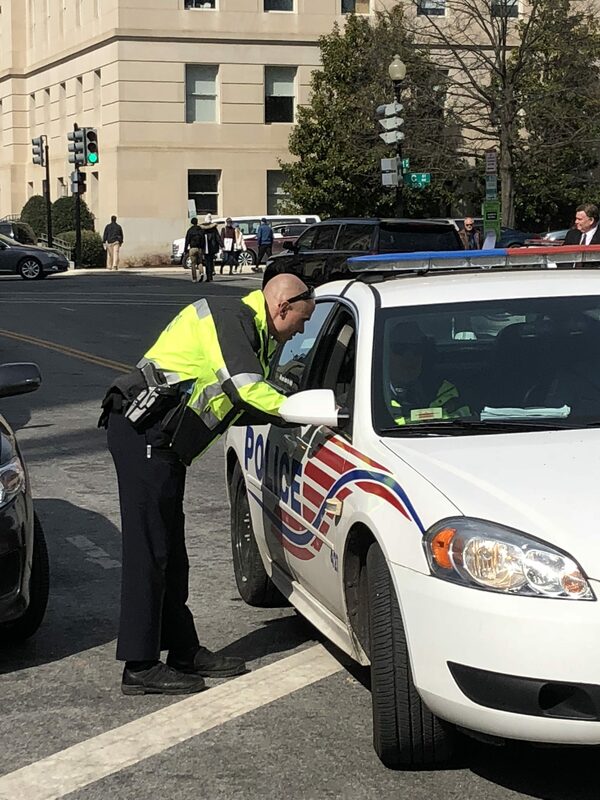 I personally witnessed multiple celebrities go to and from their limousines under the heavily armed guard of private security members and the Capitol Police. I watched Katie Couric, Cher, George Clooney and the student celebrities of Parkland all get escorted to safety by police officers who were visibly carrying holstered handguns. None of the speakers waived the protections of an armed officer. 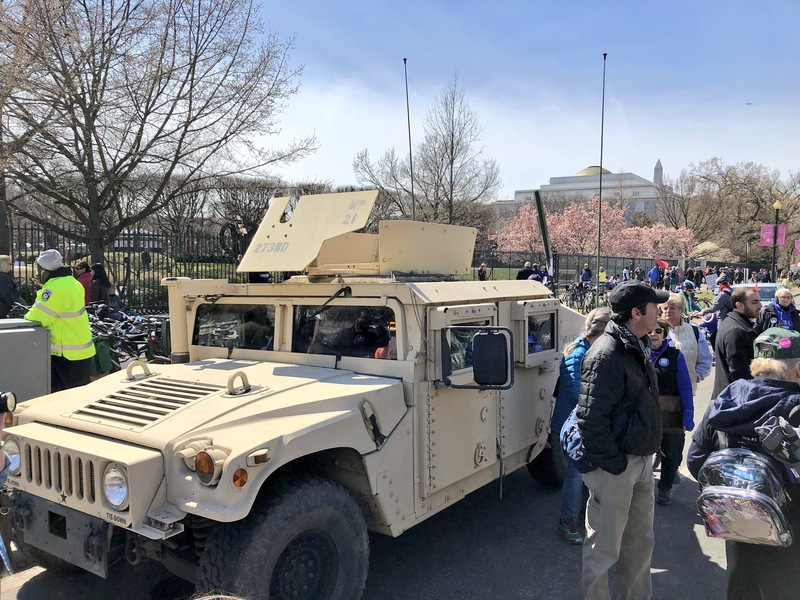 Every major movie star, singer or student leaving the rally rushed to the protective bubble of well armed security as they traveled from the gated backstage area to idling limousines and private cars. I watch this happen again and again, as armed police held back screaming fans and teenagers from harassing some of their favorite advocate-celebrities. There wasn’t a moment of irony when Cher’s private security, who I assume were packing heat, pushed me out of the way as I attempted to ask her a question. There was no irony when the same thing happened with Jennifer Hudson. Emma Gonzalez was able to briskly walk to her waiting limousine with her hoodie on, indifferent to the rabid crowds calling for her attention thanks at least in part to the armed police who kept the screaming teens at bay. George Clooney’s security, arguably the most massive force on scene that day, didn’t let a soul near him. There were also many legitimate weapons of war protecting the marchers. The point of this observation isn’t to put a stick in the eye of people who want to feel protected – especially when those people are famous and may have significant threats on their lives. The point is if you feel safe being protected by a good guy with a gun – isn’t that a right we should all have? Thank God, we still do. Contributed by Benny Johnson of The Daily Caller News Foundation.